Heres the unedited and behind the scenes full interview I did with Marilyn from Wall Township Life magazine article – Seen here. These articles are written in advance, and this past weekend thousands of people died in Typhoon Haiyan in the Philippines, a storm even stronger and more devastating than Sandy. For some of us, it is easier to identify and empathize with others when we ourselves have experienced something similar. The aftermath of Sandy was horrific. As I read about stories of looting and regular every day commodities being inaccessible, I saw myself and my son walking in the Sea Girt Foodtown, holding a flashlight, looking at how most perishable items were either gone or covered up and many shelves empty. It was eerie and also made me think about how reliant we are upon “the system” for all of our food and survival. How many of us can say that if something worse than Hurricane Sandy ever struck our area again, we would be able to go out into the woods, find food, and sustain our families? Remember, the Indians did it every day. Do you see the back woods as a dirty place for raccoons and feral cats – or can you place yourself into another year, place and time, and picture what it may have been like when humans were more connected to the land? Ever feel great after a walk down the Allaire winding road? I sure have. Aside from the exercise, that’s because the place is literally teeming with life force and energy. But there‘s another thing there that most of us fail to see – Food!!!! 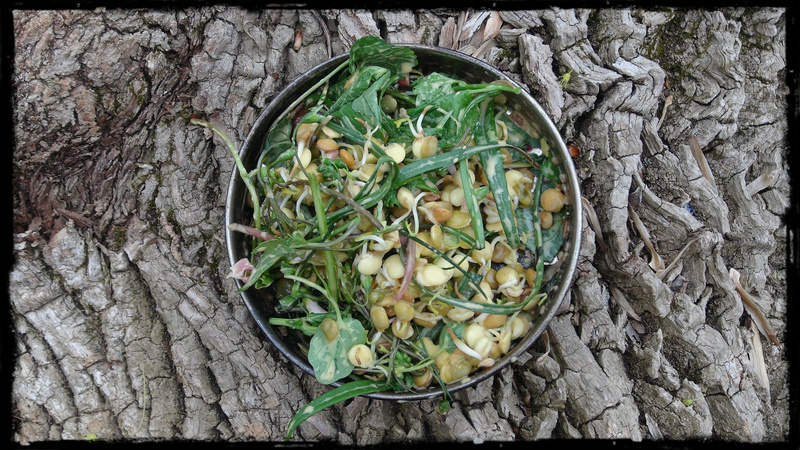 There are nut trees, berries, and even wild mustard greens all around. It’s not packed away in plastic or cans, or with a Keebler or Kraft signs. It is the original “organic” food. Remember, organic food is just labeled so because it competes with GMO and modified food, and food with toxic substances on it. We’ve been conditioned to think of Non-organic food as “normal” and “organic” as something special, when really, organic food is just the real stuff. The other belongs somewhere in a Frankenstein movie. Ever see those grapes that are the size of an elephant’s eyeball? Did you know that those springtime clovers that sweep through the grass at the North Wall Baseball field actually make a great tea? I’m sure everyone has bought clover honey. If you do your own research, some believe it is good for those suffering menopausal symptoms. The drug companies say no, and the herbalists say yes. But one thing that cannot be denied is that all of our original drugs came from wild herbs. For instance, the well-known heart medicine, digitalis, is derived from the Fox Glove plant that you often find growing in our own cultured landscapes. Do your own research. The information is there for everyone. Subjects such as these have volumes of information for anyone with an interest. Herbalists often say that the plant you need is often growing right outside your house. So maybe dandelions, wild mustard and wild plantain aren’t just unsightly weeds after all? I love horticulture, gardens, and plants and often do reading on the subject. Years ago a book called “The Secret Life of Plants”, by Peter Tomkins and Christopher Bird caught my eye. It is actually documentation of a scientific study, from a very highly educated individual, of how plants are sentient. The researcher hooked up his philodendron house plant to a lie detector, communicated with it both verbally and telepathically, and successfully recorded reactions from the plant. It was during this time that I met Dan Farella while taking a course on energy healing. Dan’s knowledge of the forest is astounding and far surpasses my own. He can literally be dropped and trapped in the woods and come out with a basket of food that would cost you a fortune at Delicious Orchards. Dan shares his knowledge on by doing nature walks all around New York, New Jersey, the Carolinas and even studied in India. I’ve taken my son on one of his walks in Princeton and we came back feeling thinking that the person who made those talking trees on Wizard of Oz must have been onto something. The forest literally comes alive when you start looking at the beautiful details of leaves, horizontal and vertical tree bark, and who knew that wild grapes grew in New Jersey?! I decided to contact Dan for an interview. I hope you enjoy his knowledge as much as I do and joint him for a Nature Walk. It’s great for any group, and it’s not something we learn in school, and something we should. He will come just about anywhere as long as there is a group of interested people to learn; and does nutrition and herbalism consultations, mentorship programs, private and group classes, all for a sensible donation or fee. Marilyn: When did your interest in the forest start? Dan: My interest in the forest really goes back to as far as I can remember. We all have these vivid flashes of our childhood; most of mine go back to times playing outside. Whether in my mom’s garden, in the tree house my dad built me, or at parks I was brought to for a walk, Native American pow wows or zoos, I got to experience it was something I had taken for granted until I started teaching. A note that parents really CAN influence their kid’s nature connection. M: What is your favorite find here in the NJ forest? learn to work with, sustain myself off of, and actually be of benefit to the ecosystem rather than just a taker, I have consumed probably 2-300 different kinds of greens, tubers, herbs, nuts, and mushrooms from the NJ parks and back yards, or anywhere I can deem is cleaner than what you might get in the supermarket. Out of those, a few greats that come to mind are chicken of the woods (laetiporus sulphureus), a delicious edible wild mushroom. Hickory nuts are one of the best tasting nuts I’ve ever had, which unfortunately has become a virtual waste product in the American consumerism paradigm. triloba). A fruit that would have literally carpeted the north east, had we taken food security into our own hands. Pawpaw is full of fats and carbohydrates; this is incredibly rare for a fruit and it is something in our current paradigm we now import from great and costly distances. M: I remember you teaching us how to use certain plants for cuts. Can you elaborate again? D: One of the best and easiest to acquire plants for cuts is common plantain (Plantago spp.). Now, this is not the plantain found in grocery stores that is related to the banana. This plant, sharing that common name, would probably be more identified as one of the pieces of “grass” on your lawn. Plantain has been worked with traditionally for thousands, if not millions of years because it was known by our ancestors to staunch bleeding, disinfect, and help repair the damaged cells wherever it was applied. Another great plant for this is Yarrow (Achillea millefolium). A plant which also shares the common name Caesar weed. It got that name from the wartimes of Caesar; when people were wounded their medics would harvest this plant fresh and make a poultice, or wash. The interesting thing is that both of these plants are imports, literally brought here by our ancestor’s grandparents to sustain and nourish us. This is the actual basis and foundation of medicine, and not the commonly believed myth that allopathy is traditional, which is really a young alternative to the ancient path of working with what is around you. Allopathic medicine is only at the most 200 years old. M: Can you tell us a little bit out different trees around us, like more about the Pawpaw? 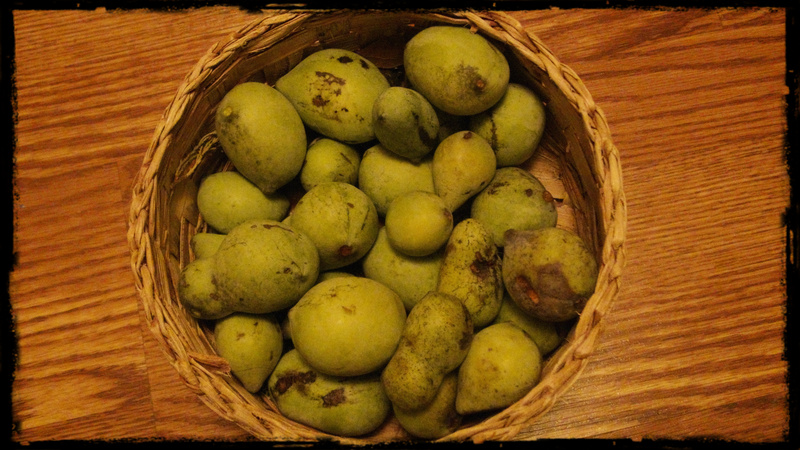 D: Despite what we have learned culturally there are hundreds of wild nuts in the forest with several bountiful trees. This is important to know for many reasons. In a survival situation, which is a tribal situation, you would have needed a lot of stores of fats, proteins, and carbohydrates to get you through the winter, hence the original way of fasting. Fats and carbs are something we take for granted in a saturated fat world where butter can be bought anywhere and has become the misplaced target for all kinds of dieting fads. But if you are learning to fend for yourself off of your own ingenuity then these sources of food become incredibly vital for existence. For me they are all one step into the right direction of my best political vote – localizing my food source! Chestnuts, for example, would have been a major staple to our area but unfortunately, when we brought chestnut trees over from China for filling our arboretums they had a fungus [chestnut blight] that wiped out the wild populations of our native chestnuts. A recent statistic I learned about chestnuts is that before the turn of the current century every 4th tree in our forest floor was a chestnut – that’s a lot of free food gone to waste, which is now a very expensive and a rare treat. 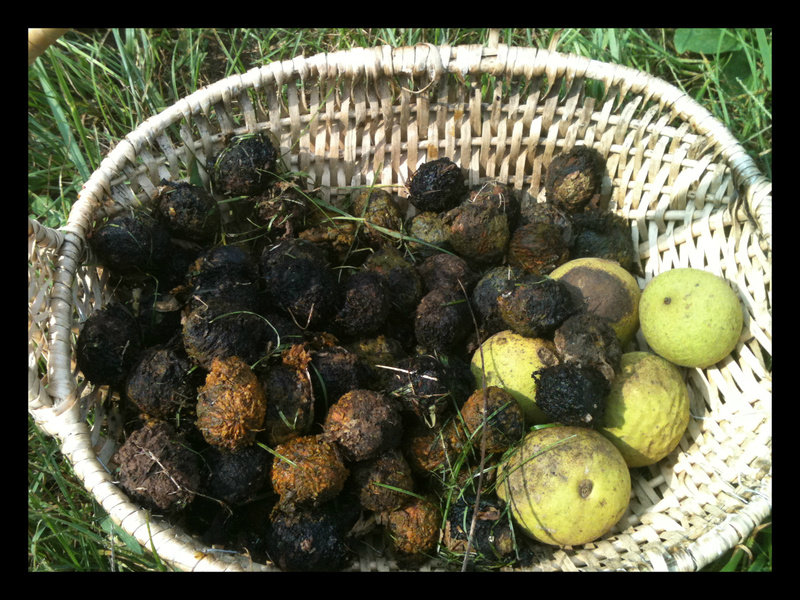 There are also black walnuts, hickory as was mentioned, persimmon and acorns, all with their special niche as to how to harvest and render them as foods. These were the secrets of our ancestors; secrets that when we re-discover, it ties a deeper thread to our ancient past and the cultures that thrived upon these lands in a sane and resourceful way. M: Can I make a salad in my back yard? 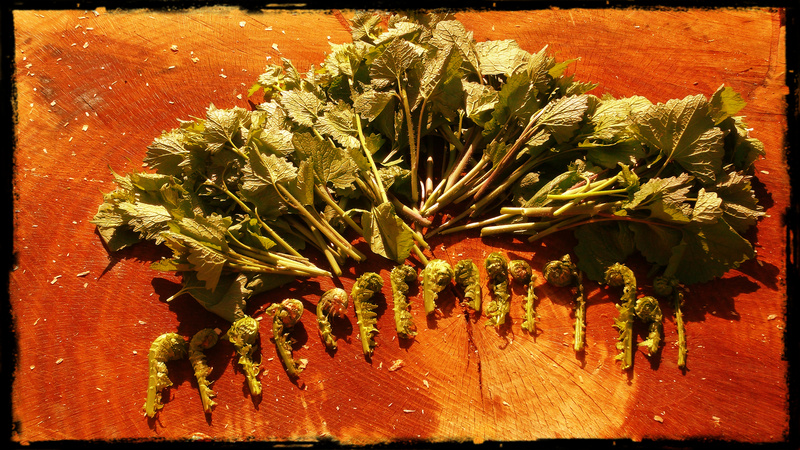 Not only salad, you can make a salad, soup, main course, second course, dessert, tea, and after dinner mint, plus fermented fruits as wines and adding wild honey meads! Consider that coupled with ecological and biodiversity preservation a sense of respecting the earth as our source of sustenance is how our grandparents, who had no grocery store, lived. This way of existence is only 2 or 3 generations or 50-100 years ago. We must dare to perceive deeper than the thought that food and medicine come from some other country, or some other business or market, and that it’s in our best interest to eradicate the invasive weeds on our front lawns. As it is said “Eat em, don’t weed em” Take your power back as a tribal, raw, real, human. M: Can I use acorns? D: Acorns were actually an incredible staple for the native peoples. In fact, a big reason why many of them starved is because Europeans brought over pigs which ate a huge amount of acorns. This was a devastating blow on native populations. The odd thing I find is that somehow the mighty Oak tree (Quercus spp.) has slipped through all of the disastrous practices our modern culture have performed on our ecosystem, and acorns can still be found in abundance. Now that doesn’t mean we are at an advantage to take, take, take and never give back to the ecosystem. This mentality is what has birthed the paradigm in which we live in. Perhaps you would take 50%, plant 15 % for next year, which means you have skill to plant trees with awareness of the next 40 years, and perhaps leave the last 30% or so for other life forms. This ensures that there will be more for the future and doesn’t create more poverty in the future. Along this line, One of the most powerful and shocking quotes I heard Tom Brown Jr. [Author and teacher of the tracker school (www.tracker.com)] passionately, and intensely exclaim was “we are a culture who sacrifices our grandchildren to our children”. The thought really stuck with me. Is it true? Are we leaving enough for any future generations? What are they inheriting? To actually be willing to feel this is where the question of ethics and care-taking become important. Trying our best to help the damaged ecosystem makes learning foraging, with a great deal of awareness, a potential solution based practice towards re-introducing ourselves into the ecosystem as an integral and necessary aspect to it, rather than a burden upon it. 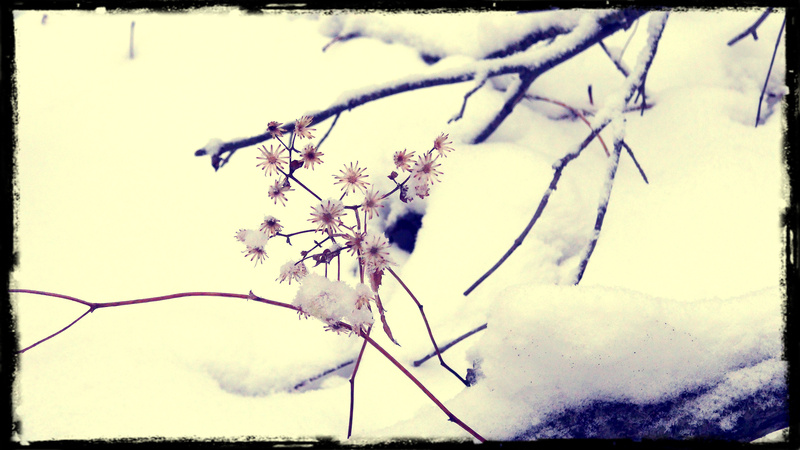 No longer perpetuating the illusion that reality is about me vs nature, which will ultimately win, but I as Nature. Is it possible to get my needs met and also fulfill the greater needs of the ecosystem? M: Do you have any further thoughts to share? To learn to get your own food from the wild is a huge empowerment; now with that said, it is important to never consume any plant, mushroom, fruit or nut that you haven’t properly identified by first and last name (latin). Your life is truly in your hands, as it always was, even while eating ramen, or the rest of the processed junk food in the store. Despite the fear and paranoia and difficulty in getting started, it is possible to learn this lost art and skill. Consider, It’s how you got this far, it’s in your DNA, and the people even as close as the great depression in the 1940’s and 50’s sustained themselves at least partially off of wild food. As I say often in plant walks, you have more DNA in your body of dandelion, which co-evolved with us over several million years, vs. McDonalds, which is only 70-80 years old. All we need to do is dust off our sense, reclaim our awareness, get some field guides, go to classes, find teachers and elders, and most importantly be willing to take our healthcare and food skills into our own hands again in a gradual, intelligent, and systematic way – this is the one blessing the scientific method has given us. 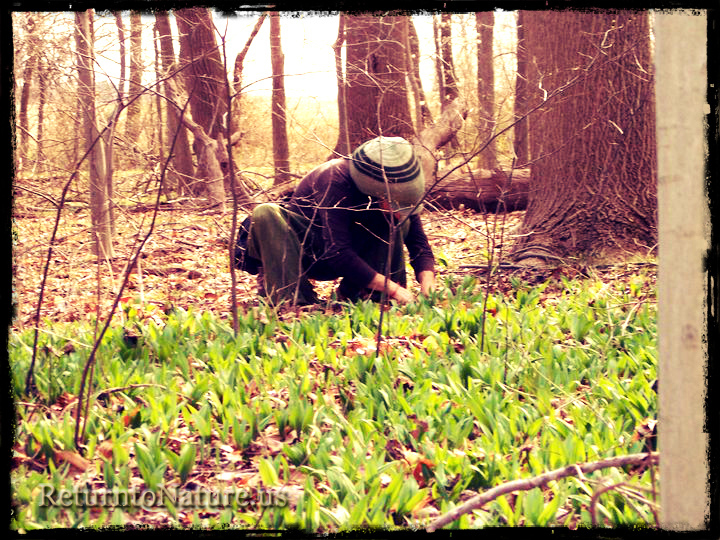 This entry was posted in Blog, Interviews, Write Ups and Podcasts, Wild Food and Medicine Articles. Bookmark the permalink. Wow! Powerful words. I love what you have to say. Thank you. Bob, thank you deeply, and agree deeply with what you have expressed. Till we meet again, brother and friend.